I was thrilled to watch the KONY 2012 video. I began traveling to LRA territory in northern Uganda and Congo in 2007 and I have seen first-hand the anguish and pain their atrocities have left behind. While in Gulu, Northern Uganda, I visited a site run by Healing Hands where I sat down with more than a hundred LRA abductees. It was there that a young man told me of being forced by the LRA at gunpoint to kill his mother, father and siblings and then being abducted to serve as an LRA soldier. I was awed by the courage, resilience and determination in these children -- and I was inspired to do what I could to help others like them. The LRA conflict in Uganda has now ended. Today northeastern Congo bears the brunt of LRA activity (alongside Central African Republic and South Sudan) -- and it was in Congo, several years ago, where the LRA's 'Christmas massacre' took the lives of 400 civilians, and made refugees out of 20,000 more. Last month, I was in Dungu (in far northeastern Congo) where the LRA militias remain active. I met scores of villagers who had suffered from recent attacks. The local UN military base 'threat level' was four out of five ("five means all-out war," I was told). Just last month several thousand citizens in the region were displaced and several people were killed. I believe there is no mission more urgent than to help children who are suffering and I applaud Invisible Children for raising the awareness of Kony (and the issue of child soldiers) to such an extraordinary level. The next step after awareness is action. There are many steps that we can take to end this nightmare. Among the most important is funding remarkable local organizations. Westerners are not and will never be the 'saviors' of Africa. That idea has been tried and found wanting. It is ineffectual at best and deadly at worst. The organization I founded, Eastern Congo Initiative, funds Congolese-led organizations that rescue child soldiers from the bush and provides them with education, medical assistance, job training, and counseling. We support the work being done by highly capable and determined Congolese, to make their communities a better place. Joseph Kony has been one of the most infamous and most wanted men in Africa for decades. His vicious cruelty has caused untold pain over the last twenty years. 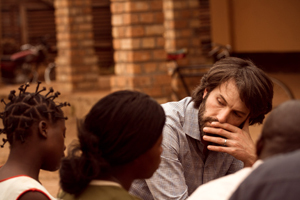 Because of Invisible Children, a hundred million more people in North America now know his story. Joseph Kony must be caught. His lieutenants must be brought to justice and the LRA abductees still in the bush -- fighting against their will -- must be rescued and rehabilitated. Yet, Kony isn't the whole story. The lack of state security in Congo has made room not only for the LRA, but for dozens of militia groups (including those responsible for the Rwandan genocide -- the FDLR -- and the Al-Shabab affiliated, ADF) who commit violence with impunity, steal from the population, and extract minerals from the earth -effectively robbing the entire country. Security must be restored in the Congo. The Congolese military (FARDC) must be trained and held accountable -- and it must be purged of criminals. The justice system must be expanded and strengthened so it has the confidence of the people. This will result in a much more peaceful, stable and prosperous Congo and region. This work may seem impossible but it is critical to remember what a disastrous state Congo was in fifteen years ago. It was ground zero in the deadliest war in modern African history. Eight nations had troops in Congo. Now, the country is on the brink of democracy and peace. But the daunting final steps require cooperation between regional governments and international organizations to get to the finish line. The AU, EU, US, IMF and important local players can help resolve this issue by responding to exactly the kind of awareness and pressure that Invisible Children has brought to bear around the issue of Kony and the LRA. I urge Invisible Children to embrace the opportunity before them and influence the million + who have been exposed to this important issue by pointing advocates to the eye of the storm where war and abducting children is still happening: Congo. Today, UNICEF estimates that at least 3,000 children are still held by the many different militia groups in Congo. To learn more about the important work of Congolese-led organizations helping former child soldiers visit some of our partners including LAV and Children's Voice and Caritas. To learn more about Eastern Congo Initiative, please visit our website.